The display doesn’t quite go edge to edge, but it’s sharp and really colourful. The snapper is an eight-megapixel model that offers a burst mode of 10 shots a second. Startup is quick from sleep mode, but the shutter lag is frustrating. It looks good and is made to be durable – there’s even splashproofing to keep the insides safe. We also couldn’t stop stroking the soft rear panel! A real strength – you’ll get a good day out of a full battery on light use, while if you play with lots of apps it will last a full day. Video streaming gives you an excellent eight hours. The RAZR i runs on Android Ice Cream Sandwich, offering easy access to the most-used settings and features. The large display is just perfect for going online and playing with apps. 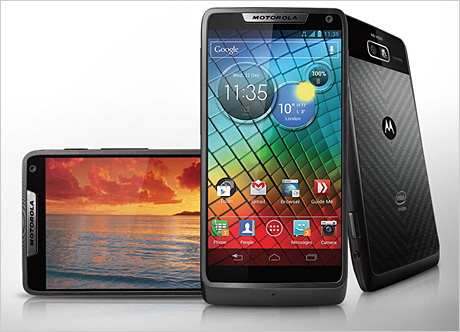 Motorola has just launched the RAZR I – dubbed its ‘edge-to-edge’ smartphone. It boasts an Intel processor (there’s only one other phone that does) and the snapper can take 10 shots a second. The screen isn’t actually quite edge to edge, and there is some shutter lag on that super camera, but nevertheless, it looks like Motorola may have come up with a winner here for anyone who wants a fast.powerful handset just made for playing with apps and games on the move. Turn over the RZR i and you’ll see a soft Kevlar back that is very soft to the touch. It’s also scuff-resistant, and with the Gorilla Glass display, this proves a phone that can be flung in your bag or pocket without sustaining damage. The phone itself feels as if it is crafted from tough plastic – in fact the front is made from aircraft-grade aluminium, while the back, as we said, is made from tough Kevlar. Motorola has already proved it can create tough phones with its Defy series, and the RAZR i is maintaining the tradition. The memory card and SIM card slots are protected by a flap, while there is splashproofing to protect the fragile insides should water get in via the headphone and USB sockets. It managed to survive a rainstorm, but we doubt it would live if it got dropped in the loo, for instance. You’ll see there are no touch buttons sitting beneath the display – instead the Recent App, Home and Back buttons can be found on the Android desktop. However, Motorola has still left a black border between the screen and the bottom of the handset – it’s a pity, as the designers could have stretched the screen right across the phone for a true edge-to-edge screen. It’s a shame because if that had been the case the screen would be perfect for widescreen films – as it is you’ll have to put up with a border above and below any widescreen movies you choose to view. The 4.3in display is, nevertheless, a standout feature of the handset – and it does stretch further than on most smartphones, although there is still a 2-3mm aluminium frame around it. It is appealing visually and offers a really spacious experience when viewing films or playing with apps. It is also really bright and has great viewing angles – useful if you’re watching a video clip with a friend. The colours are rich and deep – more so than on rivals such as the HTC One phones. And that Gorilla Glass coating proves solid – push on it and you’ll see no distortion whatsoever. The RAZR I runs on Android Ice Cream Sandwich, which runs beautifully smoothly (thanks to that 2GHz Intel Atom chip) and has a few Motorola touches. First, there is only one homepage – but move left and you’ll find a very handy settings screen, where you can toggle on features such as Wi-Fi and fiddle with your profile. Drag to the right and you’ll see you are able to add more pages where you can install widgets and apps. Far better than having five pages already full of stuff you don’t want, which then has to be deleted. Motorola has also added its Circles widget, which lets you know how the weather’s doing, what the time is – and if you have any notifications. Flip up the circles and more information is available – for instance, the notifications circle reveals a battery life indicator. The digital clock can be flipped to show an old-style analogue clock face. It’s a simple idea but quite addictive. Under the hood sits an Intel’s Atom chip, which may not be as powerful as the quad-core models found in the likes of the HTC One X and the Tegra 3, but is nonetheless good enough to run all the latest intensive games such as Dead Trigger. It suffered no stuttering or any other problems – and Android ran as smooth as smooth can be. If you’re a real games fan, you may prefer to look towards these other handsets, with their quad-core chips and bigger displays. When you want to take a photo, just hit the dedicated shutter key – which sits on the right-hand edge of the handset – and it will fire up the camera, even from sleep mode or another app. Press it again to take your shot – the shutter does suffer from some lag and it takes around a second to fire. Again, the Samsung Galaxy S III and HTC One X are faster. The user interface is really cool and keeps the features out of the way until needed. One of the best is the multi-shot burst mode, which snaps up to 10 images a second – the two rivals we’ve already mentioned, the HTC One X and Galaxy S II, can only manage three or four. We used it to take shots of a water spray and a speeding car – the results were amazing. Flicking through them was akin to watching a film. But you still have that second of shutter lag, which could lead to you missing out on the moment. Images came out well, and looked sharp when we looked at them on a bigger screen. Colours are lifelike, although not that bold, and in low-light situations our images were impressively bright, although there was some blur or graininess. The bright LED flash helps a lot, and manages not to overexpose everything. Battery life is also impressive – Motorola says it offers 40% more life than you get from a single charge on the iPhone 5 – and indeed we used the phone for two days’ worth of texting, emailing, a few calls and some basic app play. With more power-hungry tasks such as streaming films, taking snaps and playing with apps, we managed just over a day. Streaming video will drain the battery in eight hours, which is still pretty decent. This is one of the best Motorola smartphones we’ve seen. It combines a stylish design with a sharp wide display and Intel power. It’s simple to use and should suit web browsers, media fans and gamers – plus it has great battery life. The snapper is feature-packed and offers a great burst mode – only that delayed shutter time lets it down a tad.